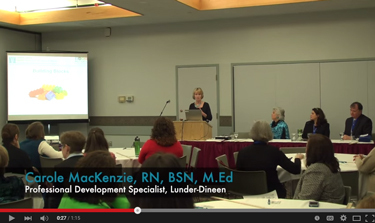 In April, representatives from Lunder-Dineen and its MOTIVATE advisory team presented a breakout session on our MOTIVATE oral health education initiative during the Maine Quality Counts QC2015 conference at the Augusta Civic Center, attended by approximately 1,100 Maine health care professionals. MOTIVATE – Maine’s Oral Team-Based Initiative: Vital Access to Education – is an innovative and Maine-tailored education program developed by Lunder-Dineen and a statewide advisory team. It was developed in response to national calls-to-action from the U.S. Surgeon General, American Dental Association, Robert Wood Johnson Foundation, and others to raise awareness about the connection between good oral health and good overall health. 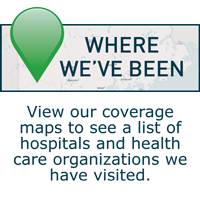 The project’s mission is to use the latest research findings to improve, promote and protect the oral and overall health of long-term care residents in Maine using evidence-based programs in a collaborative education and practice model. During the session, attendees learned about the framework behind the project, which allowed them to consider both the value of establishing collaborative interprofessional partnerships and the potential for adapting the MOTIVATE model to a wide range of community-based health initiatives. For those that missed this presentation in April, Lunder-Dineen will be presenting a similar breakout session on Friday, June 12, at the 25th Annual UNE Geriatrics Conference in Bar Harbor. For more information, please visit www.une.edu/com/cme/events/geriatrics-conference. Learn more about the MOTIVATE initiative at lunderdineen.org/oral-health-motivate. 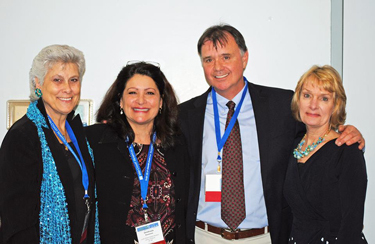 Following the Maine Quality Counts QC2015 conference, the Lunder-Dineen team also exhibited and presented during a poster session at the statewide gathering of the Nursing Leaders of Maine (OMNE) annual education summit, also in held in Augusta. 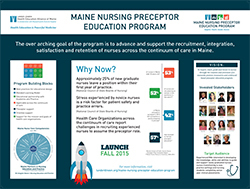 The focus of the poster was to educate attendees about the Lunder-Dineen Maine Nursing Preceptor Education program scheduled to launch this fall. This will be a free, state-wide program. To learn more, please visit www.lunderdineen.org/maine-nursing-preceptor-education-program. 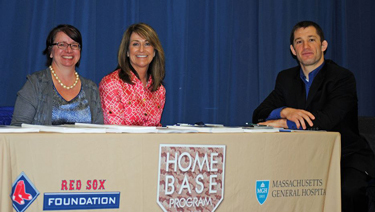 Lunder-Dineen introduced Massachusetts General Hospital colleagues from the Home Base Program to OMNE who also presented that day delivering education for the nurses on how to meet the needs of caring for Maine’s ‪veterans, service members, and their families. 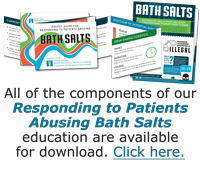 This one-hour older-adult-focused webinar was recorded during the University of New England’s 24th Annual Maine Geriatrics Conference and addresses polypharmacy in the elderly, including critical decision points in the use of multiple medications, antipsychotic medications, and potentially inappropriate medications. This session is intended for nurses, nurse practitioners, physicians, physician assistants, nursing facility administrators, certified nursing assistants, psychologists, social workers, mental health practitioners, occupational therapists, physical therapists, substance abuse counselors, and all others interested in the field of aging. Medical/Social Imperative: Do Health Care and Community Care Providers Need to Talk? This one-hour older-adult-focused webinar was recorded during the University of New England’s 24th Annual Maine Geriatrics Conference and examines the importance of consistent and coordinated dementia care, the limitations of the current dementia care system, medical and community resources, and an integrated medical/community dementia care model that works. Webinar: Medical/Social Imperative: Do Health Care and Community Care Providers Need to Talk?